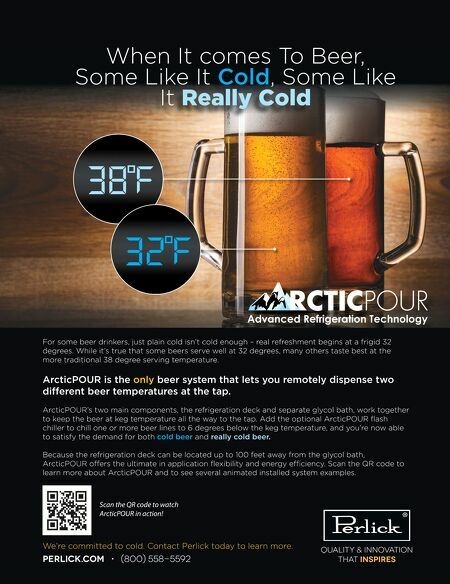 16 • FOODSERVICE EQUIPMENT & SUPPLIES • JANUARY 2014 trends & tidbits FE&S reports on the hottest trends in tabletop design, concept development and other areas of the foodservice industry — both at the back and front of the house. 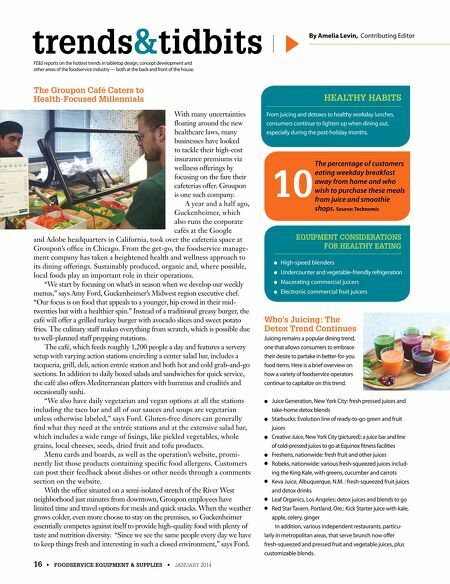 By Amelia Levin, Contributing Editor HEALTHY HABITS The Groupon Café Caters to Health-Focused Millennials With many uncertainties foating around the new healthcare laws, many businesses have looked to tackle their high-cost insurance premiums via wellness offerings by focusing on the fare their cafeterias offer. Groupon is one such company. A year and a half ago, Guckenheimer, which also runs the corporate cafés at the Google and Adobe headquarters in California, took over the cafeteria space at Groupon's offce in Chicago. From the get-go, the foodservice manage- ment company has taken a heightened health and wellness approach to its dining offerings. Sustainably produced, organic and, where possible, local foods play an important role in their operations. "We start by focusing on what's in season when we develop our weekly menus," says Amy Ford, Guckenheimer's Midwest region executive chef. "Our focus is on food that appeals to a younger, hip crowd in their mid- twenties but with a healthier spin." Instead of a traditional greasy burger, the café will offer a grilled turkey burger with avocado slices and sweet potato fries. The culinary staff makes everything from scratch, which is possible due to well-planned staff prepping rotations. The café, which feeds roughly 1,200 people a day and features a servery setup with varying action stations encircling a center salad bar, includes a tacqueria, grill, deli, action entrée station and both hot and cold grab-and-go sections. In addition to daily boxed salads and sandwiches for quick service, the café also offers Mediterranean platters with hummus and crudités and occasionally sushi. "We also have daily vegetarian and vegan options at all the stations including the taco bar and all of our sauces and soups are vegetarian unless otherwise labeled," says Ford. Gluten-free diners can generally fnd what they need at the entrée stations and at the extensive salad bar, which includes a wide range of fxings, like pickled vegetables, whole grains, local cheeses, seeds, dried fruit and tofu products. Menu cards and boards, as well as the operation's website, promi- nently list those products containing specifc food allergens. Customers can post their feedback about dishes or other needs through a comments section on the website. With the offce situated on a semi-isolated stretch of the River West neighborhood just minutes from downtown, Groupon employees have limited time and travel options for meals and quick snacks. When the weather grows colder, even more choose to stay on the premises, so Guckenheimer essentially competes against itself to provide high-quality food with plenty of taste and nutrition diversity. "Since we see the same people every day we have to keep things fresh and interesting in such a closed environment," says Ford. From juicing and detoxes to healthy workday lunches, consumers continue to lighten up when dining out, especially during the post-holiday months. EQUIPMENT CONSIDERATIONS FOR HEALTHY EATING ● ● High-speed blenders ● ● Undercounter and vegetable-friendly refrigeration ● ● Macerating commercial juicers ● ● Electronic commercial fruit juicers The percentage of customers eating weekday breakfast away from home and who wish to purchase these meals from juice and smoothie shops. Source: Technomic 10 Who's Juicing: The Detox Trend Continues Juicing remains a popular dining trend, one that allows consumers to embrace their desire to partake in better-for-you food items. Here is a brief overview on how a variety of foodservice operators continue to capitalize on this trend. ● Juice Generation, New York City: fresh pressed juices and take-home detox blends ●● ● Starbucks: Evolution line of ready-to-go green and fruit juices ●● ● Creative Juice, New York City (pictured): a juice bar and line of cold-pressed juices to go at Equinox ftness facilities ●● ● Freshens, nationwide: fresh fruit and other juices ●●● ● Robeks, nationwide: various fresh-squeezed juices includ- ing the King Kale, with greens, cucumber and carrots ●●● ● Keva Juice, Albuquerque, N.M. : fresh-squeezed fruit juices and detox drinks ●● Leaf Organics, Los Angeles: detox juices and blends to go ●● ● Red Star Tavern, Portland, Ore.: Kick Starter juice with kale, apple, celery, ginger In addition, various independent restaurants, particu- larly in metropolitan areas, that serve brunch now offer fresh-squeezed and pressed fruit and vegetable juices, plus customizable blends.